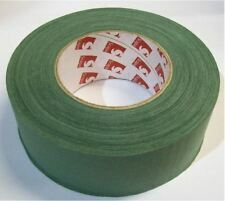 Full roll of green cloth fabric repair tape, as widely used throughout UK forces. 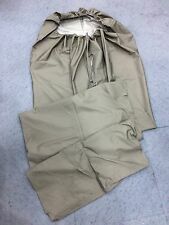 REPRODUCTION BRITISH ARMY OLIVE GREEN BIVVY BAG. 100% Waterproof & Breathable Bivvy bag made out of genuine MOD issue surplus MVP material. This bag will keep you dry from that early morning dew/mist and even the heaviest rain fall. Sizes 44cm wide x 19cm deep x 37cm high. ALL photos show the ACTUAL bivi you will receive so you can see for yourself it is still in good condition with plenty of life left in it. MTP CAMO GORETEX BIVI BAG / SLEEPING BAG COVER. These are superb pieces of kit, coupled with a sleeping bag they give you the ultimate protection when camping and being fully waterproof and breathable you can even sleep out under the stars without the need for a tent! Original MTP (current issue) British Army basha, tent, tarp, poncho - whatever you want to call it. Works well on its own to provide shelter or over a hammock. Condition is GRADE 1. Found in all the tool rolls. This is the last one I have. WRENCH B.M. 2 IN. MORTAR C.M.7180. Genuine issue dpm basha. goretex so fully waterproof. Easy to fit and remove, these will integrate with most PLCE type webbing systems using a 6 point yoke. Shown here fitted to Hamilton's Webbing and UK issue PLCE Infantry bergen, these are not included, contents for illustration, this item is supplied empty. Genuine British Army Peltor Ear Defenders. Condition is Used. Dispatched with Royal Mail 2nd Class. Rare unusual find. Very good used condition with no holes, tears or repairs (. ). GENUINE CURRENT BRITISH ARMY ISSUED FIELD / BASHA COVER. LARGE SIZE, APPROX 5FT X 7FT. PROVIDES AN EXCELLENT QUICK FIELD SHELTER. IN THE CURRENT MULTI TERRAIN PATTERN CAMOUFLAGE. STRONG NYLON FABRIC STITCHED OVER SEAMS. SA80 transit roll. This Wpn roll holds four individual rifles. Delivered via Parcelforce 48 hr. (PICTURES FOR ILLUSTRATION PURPOSED ONLY !). 2 PIECE SET. Add to Favorites. PRODUCT INFORMATION. LIKE NEW CONDITION. Product Support & Advice. CAN BE USED ON OPEN FIRE OR STOVE. We′re here to help. Genuine KARRIMOR Bergen -side pouches x 2. Need new clothes for your Golok?. Here's a unissued sheath for you! British Army Washing Kit Roll Post WW2 As New. This held the man's soap, toothbrush, past, razor etc.Canvas with straps to tie around the man's waist so he could wash without putting everything on the floor. doesn't look that it as ever been used but some small scuff marks. 22 inches by 9 inches. Handmade lid for the Swedish Army Trangia 1.5mm aluminium lid, makes it easy to use the pot when hung over an open fire. available with or without strainer holes. the listing is for the lid only. the trangia us purely for display purposes.